I had planned very little on our trip. But there was one stop that I not only planned but highly anticipated. 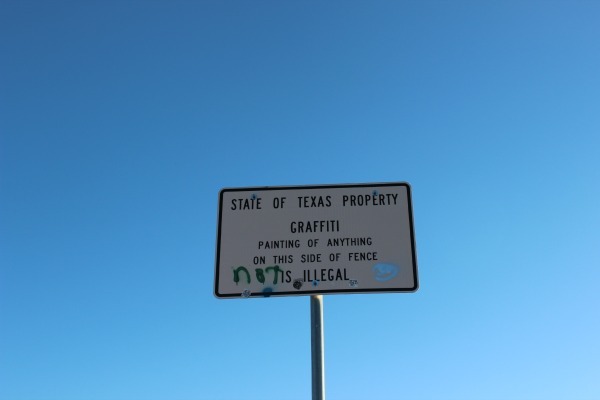 It soon became clear that my family did not share my sentiments and as we crossed into Texas from Oklahoma, those in the back seat began to grumble. It didn’t matter that we’d skipped several attractions that I’d hoped to visit. Or that we were on Day 2 of our road trip and had surpassed where I thought we’d be by hundreds of miles. We were halfway to California and way ahead of schedule, but my children decided that they did not want to stop anywhere else that night. They didn’t want to stop anywhere until we arrived in California. Period. My feeling of euphoria over our perfect first day of travel was coming to an end. Quickly. My teens had grumbled and snapped at one another for the better part of the day until one child was in the far back seat in angry silence and I was in the front, beginning to comprehend why some animals eat their offspring. My husband, who had consumed nearly a full bottle of Pepto Bismal earlier in the day, had commented that this trip would have been more enjoyable when our kids were younger. He even promised me that he and I would take another trip along Route 66 and stop at all of the roadside attractions we were missing. And that was before the straw broke the camel’s back and the tears I was trying to hold back spilled over. 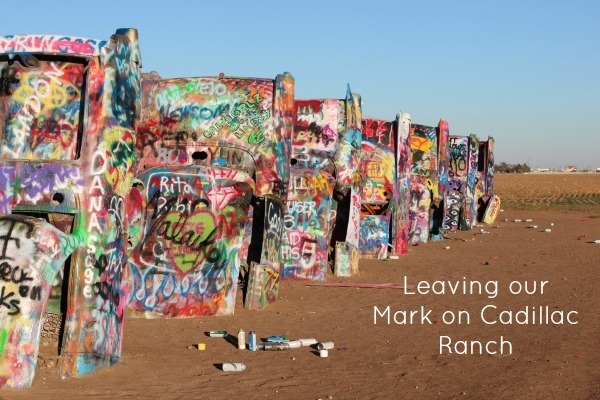 By the time we had arrived at Cadillac Ranch, I didn’t even want to stop. 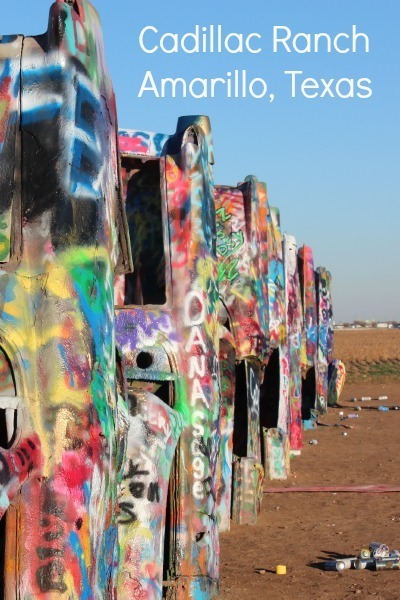 I’d like to think that when my husband and I revisit Route 66 we can have a do-over of Cadillac Ranch, but this roadside attraction is in danger of being removed. 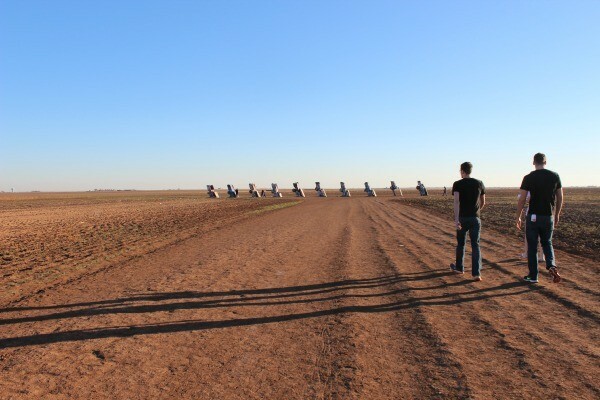 We pulled off the road and joined several other cars in the parking area and began the dusty walk through the field to the iconic automobiles armed with spray paint that I’d packed from home. 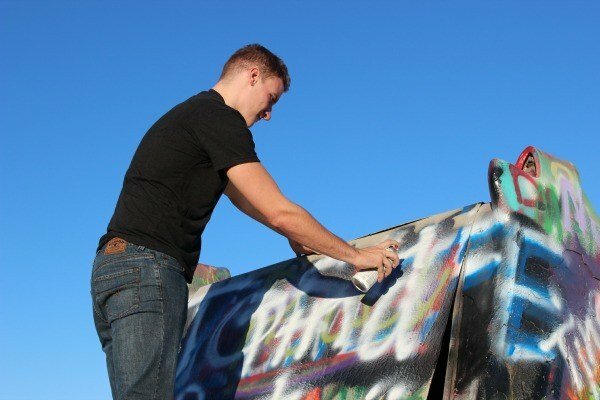 My 18-year old didn’t waste any time climbing among the cars to find what he thought would be the ideal location to leave his mark. While some ‘taggers’ get pretty creative with their craft, my kids preferred not to put in too much effort. It’s clear that whatever form of graffiti one adds won’t last long. 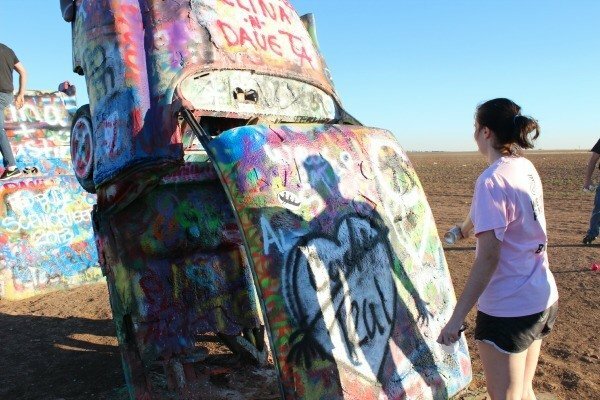 Though my kids would never admit it, I think they secretly enjoyed our visit to Cadillac Ranch. I live about 80 miles from here! I have taken my family and friends that visit there. They have all loved it. It’s odd, but it’s a must see stop! I hope that you do get the chance to go back. 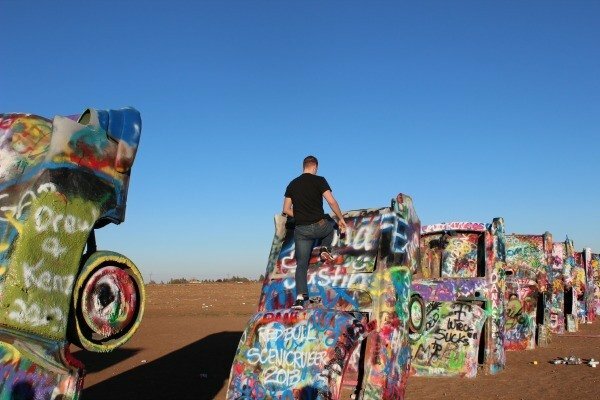 I had never heard of Cadillac Ranch, but it looks like an interesting place to go. I think it would be fun to go there armed with a few cans. It would be the ONE time that I would permit my kids to let loose. What a cool place to visit. I think my nine year old would think this was great! Sorry that the trip wasn’t as you hoped but that does look like a cool place to stop! Teens are so fun to travel with aren’t they! Glad you stopped though, and those are cool pictures. That looks like such a neat place. Sorry you are having a touch time of it though. it looks like such a cool place! My brother was there a few years ago and has some neat pics! Texas has so many fun stops! And Amarillo has several stops, including the free 72 ounce steak at Big Tex’s- if you can eat it in an hour. My son wanted to try, but we didn’t pass through at dinner time. I’ve been wanting to visit this place, too. I guess I better hurry up before all my kids are grumbly teens or before it’s removed. Oh geez, not exactly like you envisoned, huh? One day you’ll look back and laugh? That sounds like a wonderful road trip, Wendy! And October should be beautiful weather all the way around. I’m keeping my fingers crossed that I’ll make it back to the Grand Canyon this year. There is the cutest town nearby called Williams, Arizona. We only had time to drive through, but I’m hoping I’ll have time to stop and explore next time. It had little shops and diners and was so cute. Enjoy your trip and if you have any questions, I’m happy to help where I can.